Hartland Aikido Club, North Devon: Aiki Weapons Class 6th May - Don't miss it!!! Aiki Weapons Class 6th May - Don't miss it!!! I'm pleased to announce that the Hartland Aikido Club will host a special aiki weapons class taught by Sensei Richard Small (4th dan, Takemusu Iwama Europe) on Monday the 6th of May. As a general principle, the Hartland Aikido Club teaches 'Ki Aikido', following the teaching of Koichi Tohei Sensei. Sensei Small's Aikido background is in a different tradition, often called 'Iwama Aikido, based on the teachings of Morihiro Saito Sensei. One of the clear differences between the Ki and Iwama styles is the greater emphasis given by the latter to practice using the jo (wooden staff) and bokken (wooden sword). Moreover, as I have mentioned before, the way in which the two styles of aikido use the weapons differs considerably. Not only are our formal 'routines' (the katas) different but also the qualities of movement which we strive to perfect are different in some respects. So does that mean that one of us is right and the other is wrong? No, absolutely not. The fact of the matter is that we have two simple wooden sticks at our disposal. It is rather amazing that we can get anything at all of consequence from practising with them. In fact, we are able to obtain enormous value from jo and bokken practice which can also assist our free-hand aikido. In our regular classes at the Hartland Club, we explore one tradition (perfected by Tohei Sensei). In his class on the 6th of May, Sensei Small will explore some aspects of another tradition (perfected by Saito Sensei). In my view, both traditions are of equal value and students who approach the subject with an open mind will have the opportunity to enhance their appreciation of the great merit of weapons work in aikido. I should also point out that the Hratland Aikido Club welcomes students from all styles of aikido (and indeed, other martial arts). So whether you are a complete beginner or an old hand, you will be very welcome to join us at Sensei Small's aiki weapons class or at any of our regular classes. Sensei Small's Aiki Weapons class will be held at the Bucks Cross Village Hall, between 7:30 and 9:30pm on the 6th of May 2013. Cost is £5 for two hours (£3 for unemployed/retired). 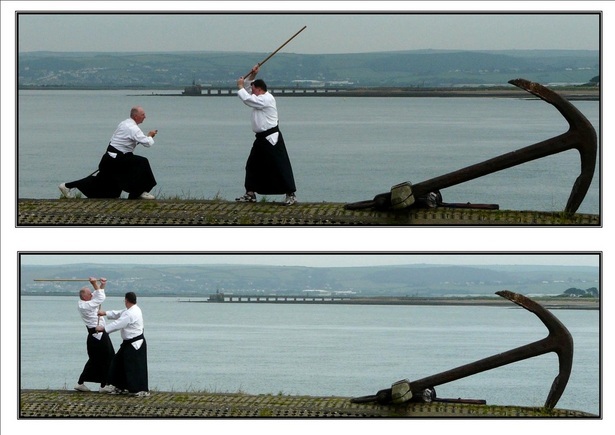 If you have any interest at all in the use of weapons in aikido, please come along!